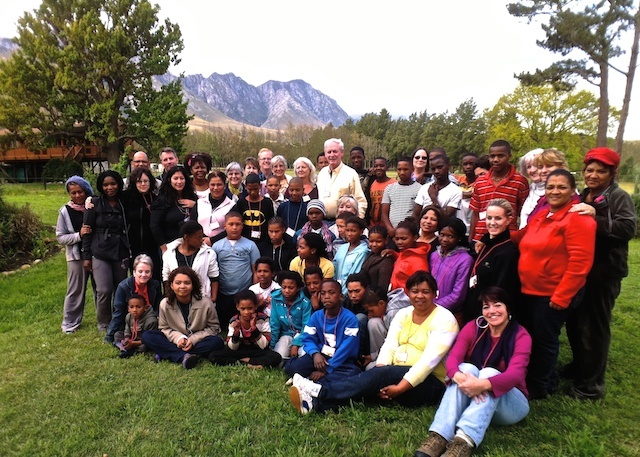 All the kids and adults at Camp Ubuntu. This photo includes the voluntourism group from Austin that joined us for part of the event. Martin, as usual, was behind the camera. How do I describe this past weekend? Wow. Astounding. It was amazing watching kids who were so shy get comfortable, open up, show themselves to be the amazing beings that they are. We started off with kids who were shy, backward, uncomfortable even saying their own names, to kids who did trust falls, a love wash, and Dances of Universal Peace. Many of you don’t know what these things are. That’s okay. What you do need to know is that we watched the blossoming of twenty-eight souls. We watched them, and maybe helped to facilitate a little bit, their blooming. We sang silly joy songs with them (a lot of silly songs—I think it was probably the favorite part of camp for many of them). What blew me away was that I kept hearing the joy songs sung during free time. So those positive messages just kept getting played and replayed in their heads, in their words, in their games. We organized events and worked with schedules that just kept changing. The word schedule kind of became laughable by the end of the event, it was really just more of a suggestion. We did Dances of Universal Peace with them, and I personally got to gaze into the eyes of at least three-quarters of the kids and sing to them and try to give them, through my eyes, a little of the love I have for them. We ate s’mores (who knew it would be so dang hard to find graham crackers in South Africa? FYI, coconut cookies make an adequate substitute). We did trust falls. We had scads of free time, in a beautiful setting. We had campfires. We did a love wash! And when it was my turn to go through, I was in tears by the end because so many of these kids reached out to me to tell me I was amazing, I was loved, I was beautiful. I was, and remain, blown away by the depth of this experience. You know, Martin and I are YOU (Youth of Unity) leaders in the states. And we’ve done quite a few weekend events (rallies, they’re called) with teens before. And we’ve done every thing that we did at this event with teens at rallies (except, I think, the s’mores). And I have been profoundly moved, sometimes to tears, at rallies in the past. But I don’t think I can describe to you the depth of this experience and how it compares to rallies that we’ve done in the past. I think a lot of the difference is in the kids. In the US, most kids that we deal with have pretty good lives, all things considered. They have their problems, don’t get me wrong. But the difference in degree of the problems is mind-blowing. In the US we don’t generally see kids who’ve been raped, who’ve lost one or both parents, who don’t get to eat regularly, who have to fight for every scrap of food they eat, who don’t have adequate shoes or clothes. We don’t see kids who have to take care of their little brothers and sisters because the parents are sick, or dead, or drunk, or doing drugs. These kids have all these obstacles and more. These kids live in conditions that make my head spin. And these are the kids who are at leadership camp, because they are doing well in school and have not given up. How many kids are there who’ve lived these same traumas and have given up? So all the beautiful settings in the world—and it was beautiful—don’t make up for these facts. But at the same time, if they haven’t given up, how can we give up on them? We can’t and we don’t. So to see these kids looking me in the eyes as we did Dances of Universal Peace, to see them sharing and supporting each others’ dreams, to see them trusting each other to literally catch them as they fell…well, yeah. It was big. Huge. Ginormous. It was better than any rally I’ve ever been to, and I’ve been to some pretty epic rallies. And our dreams? Well, they may never again be the same. This entry was posted in Connection, Giving back, Passion, Trusting, What do you want to be when you grow up? and tagged getting all philosophical, listening to the Universe, Unity, YOU by Luna.Bookmark the permalink. having such a fantastic experience. Blessings to you and the group. Beautiful. This writing brought me to tears. You, Martin, Robin, and everyone else involved are Lights of the World. I am proud to know you and to call you my friend. Many blessings of all things good.